One of the key changes in last week’s Strategic Review, which saw Ofcom move to increase the separation between BT and the division responsible for its UK phone and broadband network (Openreach), was the proposal to introduce a new wholesale Duct and Pole Access (DPA) solution to help ISPs build alternative networks. The DPA strategy aims to promote the large-scale roll-out of new “ultrafast” cable (DOCSIS) or fibre optic broadband services by opening up BTOpenreach’s huge network of telegraph poles and cable ducts to rival ISPs / alternative network (altnet) providers. Any industry observer reading last week’s announcement would have been immediately reminded of a similar solution that was introduced via Ofcom some years earlier, which brought about the introduction of a very similar sounding Physical Infrastructure Access (PIA) solution that also allowed rivals to access BT’s underground cable ducts and telegraph poles. However BT warned that going down this route again might not create the sort of improvement that Ofcom hopes to see as the operator had not itself witnessed much in the way of “meaningful” demand for PIA. Indeed outside of a few niche deployments, such as by ISPs like Call Flow Solutions and others, PIA has not really had a significant impact. But there is another side to this story. ISPs have often complained about the restrictions inherent with PIA (perhaps we should call it PIA+ after the 2013 tweak), which they say created somewhat of a chicken and egg problem that made it “not fit for purpose for scale use.” A variety of issues from awkward costs to tedious administrative processes are often highlighted. On top of that PIA was intended more for helping to connect residential properties and could not be used for providing rural backhaul or big business connectivity (e.g. leased lines), which would have threatened BT’s own solutions. But being able to use cable ducts for this purpose can also play a pivotal role in making the economic case for building new connectivity. The regulator’s new “long term strategy” is thus to take a more proactive approach with Duct and Pole Access (DPA) by making it “much easier for competitors to access” (both for business and residential purposes), which if not for some re-branding on the name might perhaps be better described as PIA++. But Ofcom also admit that this kind of investment is currently “most viable in denser urban areas and other places with strong demand for new services,” thus more regulation will also be needed to ensure that BT provides access to its range of “active products” (these allow rivals to buy capacity on BT’s network to deliver services to premises) in places where the “private sector cannot offer competing infrastructure investment” (e.g. rural locations). • Better information. We will require Openreach to establish an online database, accessible to all of its wholesale customers. We expect this to include the location, condition and capacity of the infrastructure deployed. We expect that a database containing information that already exists could be made available relatively quickly, and over time proactively extended to capture a richer dataset. It should allow competing operators to plan new networks with a degree of certainty that is currently impossible, significantly reducing the level of commercial risk associated with such networks. • Equivalence of inputs. We will work to apply equivalence of inputs to Openreach’s provision of DPA, so as to require Openreach to provide DPA to all communications providers (including other parts of BT) on the same timescales, terms and conditions, and by means of the same systems and processes. We expect only to consider exceptions to this where it would result in a disproportionate level of costs being incurred, such as in relation to certain existing network infrastructure as opposed to where new network assets are deployed. • Efficient operational processes. We will work to ensure that efficient operational processes for using DPA are established early. We will do this in part by supporting and, where necessary, enhancing the work of industry working groups and the Office of the Telecommunications Adjudicator. We will ensure that the relevant dispute resolution processes are in place to resolve any disputes quickly and efficiently. • Pricing. We believe that the pricing of the existing DPA remedy is broadly in line with international comparisons. This was supported by stakeholder submissions. We will review pricing as required, including ancillary service charges such as survey costs or costs to access information, to ensure the product can be effective. • Making DPA available for business as well as residential consumers. The current DPA remedy is designed to support the provision of broadband services to residential consumers and small businesses, and cannot be used for connecting larger businesses. We recognise that operators are less likely to deploy new networks if they are unable to connect business as well as residential customers. Where DPA is used to deploy to residential consumers at scale, we will look to remove this restriction. Ofcom states that DPA will help altnets to reduce both the cost and disruption of building ultrafast fibre optic FTTH/P networks and it gives several examples, such as Vodafone’s FTTP deployment in Spain where the regulator notes that DPA “reduced the capital expenditure per home passed … by at least 40% compared to building it on a greenfield basis.” Apparently it’s also a similar story in Portugal and France. 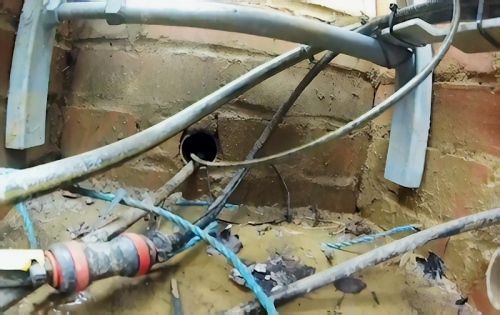 Never the less Ofcom believes that “sufficient duct space could be available in the UK to support this model of competition” and points to a 2010 survey, which found that 63% of the 90mm duct ends surveyed and 97% of the 50mm duct ends surveyed (between the street cabinet and the premise) had at least 42% of unoccupied space. Ofcom intends to introduce its changes gradually, as part of their periodic market reviews. On top of that they view UK implementation of the new Civil Infrastructure Directive on 1st July 2016, which is specifically designed to reduce the cost of deploying such networks by giving a right of access to existing civil infrastructure, as “an important starting point for implementing our strategy to make new network deployment easier and cheaper“. Going forwards Ofcom perceives DPA as steadily helping to raise demand for new network connectivity, while also reducing deployment costs, and this in turn will eventually help such solutions to reach the parts of the UK that cannot currently be reached by normal network competition. “A good outcome in the long term would be to achieve network competition of around 40% of households,” said Ofcom’s report. In areas where effective competition is achieved, based on network investment, they have also promised to remove or reduce downstream regulation. All of this sounds very positive, but then so too did the early drafts of PIA before its limitations were understood. Ofcom’s approach this time around is to try and fix those issues, but once again the devil will be in the detail and the regulator’s reluctance to tackle pricing could be another bone of contention. In the end these measures are an improvement and they could have a positive impact, but equally we wouldn’t be at all surprised if that impact ends up being somewhat less dramatic than Ofcom hopes. Even with DPA, building FTTH/P networks will remain a fairly slow and expensive process. BT and Virgin Media probably won’t be quaking in their boots any time soon. Lest we not forget that today’s broadband is still fairly cheap and if you’re already happy with your service speeds then encouraging an upgrade to something faster, but more expensive, can be a tough sell; this makes it harder to build a case for investment. Obviously such problems are less of a hindrance in locations where new networks are replacing already slow services. A test may be whether or not Ofcom’s solution encourages TalkTalk and Sky Broadband to make a more serious investment into FTTH/P. If the project had been done “the wright way around” as some were arguing years ago, and this was tackled at the very inception of the BDUK project, we might have saved the taxpayer a lot of money and seen genuine infra competition with better infra. 1. Duct blockages after sub-ducting is installed: where the ducting is very difficult to repair because of where it is, BT might have “dug around it” and re-routed. Who pays for that when there are multiple operators in said duct? Or, does whoever it is that wants to deploy, have to dig new duct around the blockage for the extra cables? 2. Related: I’d hazard a guess that the E-sides are “cleaner” which is why VDSL – getting to the cab – was quick and relatively easy. Not so with the D-sides in some/many areas where I don’t imagine the database is as much use and this area relies on the knowledge in the heads of the Openreach engineers on that “patch”. This may still mean that a new local loop needs slot cutting into pavements. That’s the “big bit”. 3. It’s very difficult to get a mortgage on a leasehold building where the lease is short, for obvious reasons. What about lease length? What about the prices, not just now, but in the future – are they “protected”: nobody is going to lease duct work and build a network only to find it made unviable by a price increase and then have to go and remove their cabling and shut the network down. Apologies for the truncated post. Android keyboard issue. I was trying to say that OR would have to be split into two divisions, one for passive infrastructure, the other for cable/fibre with equivalence of inputs between them. BT’ other divisions don’t, as far as I’m aware use OR’s passive infrastructure directly (unless you count exchange accommodation), so I’ve nod idea what Ofcom are talking about on that matter. All this would require long term price regulation, service levels and so on. Another thing that must be pointed out that all this points to Ofcom forcing OR to become a smaller business as there would inevitably be a loss of income for lines and higher level products. OR could go from a £5bn business to a £4 or even £3bn business as network income is further fragmented. But surely the loss of income is related to the success of the competition. If BT provides excellent customer service and compelling products, using the benefit of its lengthy experience, at the right prices, the competition might not get much of a look-in and the “damage” fairly minimal. That there would be competition would force BT’s prices down, of course, as the factor elevating them – scarcity of network availability – is “rectified”, enabling real price discovery in a competitive market, something we don’t have outside cabled areas. The VM article is a good example with the pricing of 50 or 100 Meg symmetric circuits relative to the hassle and cost of getting BT to plumb something in. VM clearly think they can offer at those prices, so perhaps it points to BT profiteering on the back of their monopoly in other locations. I don’t think aiming to have 40% network competition is at all compatible with OR having any sort of freedom to compete on those grounds. If an alternative network it to be built to cover 40% of properties, then it’s simply not going to be viable unless it gets a significant proportion of properties. I suppose if it was 50% of that 40% then that’s about 20% of OR’s line customer base, which would be about £500m a year. Then there’s the loss of GEA-FTTC revenue and leased line revenue, which could easily hit £1bn in total, maybe a bit more. If OR were to (somehow) keep the level of network competition down, then the writing on the wall from Ofcom is that they won’t allow that and will move the goalposts until their target is met. They did this with LLU. However, it is a serious issue as to how much it would cost to produce this network. If it’s 40% of the country then, if we look at an (optimistic) £20bn for national coverage, then that’ £8bn. If we then say that it captures half the market in each area, that’s perhaps 5m properties. I the wholesale cost was comparable to GEA-FTTC and an LLU line, then that’s about £14 per month, or a turnover of about £840m per year. If a premium can be charged to (say) £20 per year wholesale, then that’s more like £1.2bn a year. Given the operating costs would be significant, then the ROI would surely be rather long. Of course it may be that it will be a fully vertically operated organisation and more of the retail price will accrue to the network, but it s going to be demanding. nb. if the build-out was to cover VM areas then (with three operators) price competition is likely to be very keen and penetration might be lower. Both OR & VM have sunk costs and can price nearer marginal costs unless Ofcom step in with a margin-squeeze test. If the build-out is largely in non-VM areas then build costs will be relatively high. The Ofcom scheme rather implies that the conclusion has been reached, probably correctly in my long-held view, that a vertical monopoly can’t work and that competition and parallel networks are the key to providing customer choice and providing the mechanism for a continuous upgrade programme. So far as what it costs is concerned, we’ve just had to give BT a billion pounds to try to push an old fashioned dated old phone company into this century because the network had become a national embarrassment and had fallen so very far behind. Even now, in my view, it’s still only where it should have been 10 years ago, predominantly, almost exclusively, deploying tech that is dating before our eyes and won’t “keep up” while dangling “carrots” like G.Fast which would never see any kind of commercial wide scale deployment beyond cabinets requiring another round of the begging bowl, and hilariously, threatening “not to invest” – you couldn’t make it up. So far as “what the alternative networks will cost”, I don’t think we’re planning to hand out another billion pounds to anyone else, rather, competition will reduce or eradicate the need for any more taxpayer spending/subsidy except perhaps in rural areas, those which the original DCMS project sought to tackle. This should make it cheaper in the longer term, not more expensive. To suppose that BT would lose significant custom and revenue rather implies that BT would deserve to do so by failing to provide attractively priced quality products in a competitive environment. I feel BT could do rather better. And if it did so, it need not worry much. It’s difficult to see TalkTalk as currently structured making a massive network infrastructure investment. It simply doesn’t have the cashflow or financial backing. It would need some new partner with very deep pockets and/or a joint consortium to do this on any scale. Sky is rather better placed in this regard, but even they have heavy commitments on the retail side. The one potential player with very deep pockets is, of course, Vodafone. A lot will depend on whether Vodafone’s on again, off again affair wooing of Liberty Global ever comes to consummation. If the latter happens, then you can guarantee that Vodafone will be fully intent on extending the VM network, but using what technology or access model will be interesting. One very unclear point with Ofcom’s intentions is whether they see alternative networks being open access or vertically integrated (like VM). Of course there are the existing altnets like Gigaclear, but none of them are major operators and, in the national scale, won’t make a huge difference unless there was an astonishing expansion with major investment. Short of a major new nationwide provider of network infrastructure appearing (and, in reality, that would surely have to be a greatly expanded VM with new investment and a commitment to wholesale access), then the future would appear to be a patchwork of coverage in the most viable market areas. Probably some business parks and the like would benefit more. Project Lightning’s 4 million premises are the first phase of expansion. As long as take up and costs are something like as expected VM’s network will continue to grow with or without Vodafone. I was thinking about something rather more comprehensive with complementary technologies aimed at other parts of the market than (primarily) residential. Not just business, but a lot to do with mobile comms. In before complaints about the digital divide. Isn’t there already network level competition for 40% of households, or am I missing something? That only BT have to provide wholesale access is a regulatory issue. Yes I too was a little confused by Ofcom’s remark, I think maybe they mean in areas dominated by a single operator or maybe they’re referring specifically to FTTH/P but not sure. I would presume they are excluding Virgin Media at very least and potentially only including networks that at least partially use this product. I think Ofcom have seen both BT and VM planning to play it safe with copper/cable upgrades, no matter how capable, and wants to see FTTP. Specifically FTTP. It would appear they believe they can put in place a remedy on BT that will have the side effect of being a remedy on VM too. With the effect of deliberately bringing a third network into play. Whoever takes that on will have to believe they can out-market both incumbents. Always dangerous when regulators start picking technology. In any event, trying to finance three competing networks in one are is going to be a really large ask. Especially competing against those with sunk costs. To put it simply it sounds to me like an expensive and bureaucratic mess. What might be possible is that it may provide for better services and choice to business parks, specifically. And help a few small local schemes. But I suppose that Ofcom has to speak in politically correct gobbledegook. As others say, 40% availability alternate infrastructure is what we have with Virgin. It that counted or not? I can only assume that, not unusually, Ofcom’s policy is written in their lawyers’ offices to stand up to judicial scrutiny. As for a practical policy, forget it. In the early (ie Oftel) days, back when they were regulating more at the retail than wholesale level, the approach basically seemed to be to turn the screw on BT a little, watch to see what happened, and then turn it a bit more, and so on. Saved Oftel the hassle of trying to get to the bottom of BT’s impenetrable cost allocation system and eventually achieved more or less what Oftel needed to. Might be with PIA that Ofcom has decided to adopt a similar approach, and will continue to tweak things until (sufficient of) the other operators start to take advantage of it. @bob – ISPs can and do compete now. So would this enable Virgin to make use of Openreach’s ducts? Part of the reason Virgin won’t extend their network to cover us (new build estate in the middle of a Virgin area) is the cost of digging up and relaying block paving.